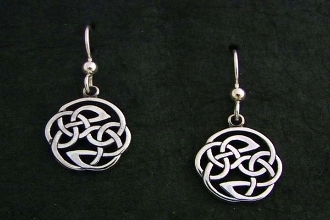 These medium sized earrings are around the diameter of a penny, but due to the cutaway structure, bear a nice presence without being heavy to wear. One of my most popular styles, I am sure these will be worn with pride, comfort, and a health dose of protection! The ancestral origen of the "Picts" lie in the Northern Highlands of Scottland, though the beauty of the "Pictish school" of artwork was incorported into the Celtic Art styles of Ireland, Whales and beyond.